Android Wear 2.0 comes to four more smartwatches—three from LG and one sporting the New Balance brand. Google's planned rollout of Android Wear 2.0 has seen its share of trouble since being announced. The latest issue involved a recent bug that delayed the software by several weeks. 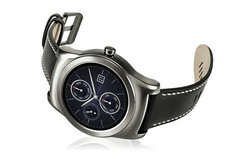 Now, it seems, things are finally back on track, as several Android smartwatches are receiving the new OS. The watches include the Watch Urbane 1st and 2nd Edition, as well as the G Watch R, both from LG. The South Korean company mentioned in a Google+ post that the G Watch R and Watch Urbane 1st Edition will begin receiving the update this week; the Watch Urbane 2nd Edition should get its turn "in the beginning of May." New Balance's recently-launched RunIQ smartwatch is the final device to graduate to the new Android Wear. Updates for the RunIQ will start "no later than April 14th." Upon updating, the four smartwatches will finally have access to Android Wear 2.0's new features. These include an optimized Material UI design, standalone apps, access to the Play Store, customizable watch faces, Google Assistant, and improved messaging, notifications, and fitness tracking. The new Android Wear update should help extend the life of these and other smartwatches, some of which are currently entering their third year of service.